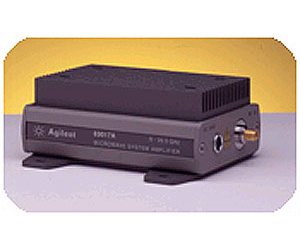 The Agilent 83017A microwave system amplifier is a compact, off-the-shelf amplifier designed for systems designers and integrators. This amplifier provides power where you need it to recover system losses and to boost available power in RF and microwave ATE systems. The ultrabroad bandwidth from 500 MHz to 26.5 GHz allows the designer to replace several narrow bandwidth amplifiers with a single Agilent amplifier, eliminating the need for crossover networks or multiple bias supplies.